Pray for the people of Victoria, Australia. This is a serious post, something I'm not normally known for. 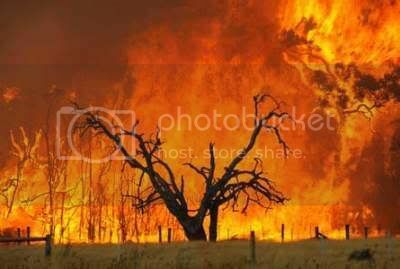 Bush fires are raging out of control across too much of our small state. A body count of 131 people have been confirmed, so far, but it could well rise by another hundred, as police and armed forces move into the burnt out ruins of peoples homes. Our Police Commissioner has announced, "All fire-devastated areas will be treated as crime scenes to determine if arson was involved," as news reports are saying that many have been deliberately lit. At one stage it was reported that one firebug had returned to re-light fires that had been put out. It makes me sick to think that anyone could do such a thing. This has been declared "Australia's worst natural disaster by far: worse than Ash Wednesday, Black Friday and Cyclone Tracy." For those of you so inclined, our people need all the prayers you can spare. edited to add a news photo of one of the fires. Puppy, I've been thinking of you today. Are you near the fires, in any danger? My thoughts and prayers go out to all of those who have been affected. thanks, mate, but i'm lucky. none of them is close enough to have us on alert. but some are only an hour's drive from melbourne!!! that's pretty scary! my sisters who live in Wodonga are close enough that they are copping a lot of smoke, but they're not on alert yet. as i'm asthmatic, i'm making sure i keep my ventolin close at hand, as we have gotten a little smoke already, but it could get worse. the stories on the news bulletins are heart breaking. so many have nothing left but the clothes on their backs, literally! one woman, a fire fighter, has nothing left but her uniform. she was out fighting the blaze when her home was burnt to the ground. :-( at least her kids weren't there when it happened. I know we talked about this the other night? But it just makes me sick to think of all those people gone. And because of a sick moron going around and starting these fires? Then coming back to re-light them? Not right! I hope this gets better and quick. My thoughts and prayers are there for everyone-be safe hon! it suckz!!! the current death toll iz 181! and there will be more, as they search larger farming propertiez. most of the one'z found have been in burnt out carz, as they tried to escape. :-( they are saying the firebugz, if and when they catch them may be charged with murder. they should be, the bastardz!!! one survivor said they should be sent in to pull the burnt bodiez from the carz. the only problem with that iz they could actually see that as a good thing, seeing their handy work and all. we're pretty safe here and have only had a little smoke, so far, but i'm making doubly sure not to go anywhere without my trusty ventolin!!! thankz, mate. these ppl need all the prayerz and good wishez they can get! :-( the current death toll iz 181 and still rising. I saw that on the news this morning, it's so awful. I can't even imagine how scary it must be.